The influence of Mexico on Texas interiors is often seen through some of our flooring choices. Ceramic tile flooring has a number of advantages that make it the perfect choice for homes in Texas, including availability of a variety of different patterns and color options as well as helping to regulate interior temperature during the hot summers. Temperature moderation is one of the most valuable attributes of a stone or ceramic tile floor. Ceramic is not a porous surface and it does not retain temperature. How is that an advantage in Texas? It can help make your home more comfortable in the heat and help you save on your cooling costs too. And the sun will not bleach or fade the color of a ceramic tile making them the perfect choice for rooms that receive high sun exposure. Ceramic tiles are fire proof and are not an accelerant to home fires, making them a safe choice. They are treated with glaze and texture to make them slip resistant which is ideal for homes with children or for individuals with mobility issues. The non-porous nature of tiles also makes them hygienic for areas such as the kitchen, bathroom or commercial high traffic spaces. Rethink what you thought you knew about ceramic tile and consider our selection of fashionable, durable and affordable tile for your home renovation. 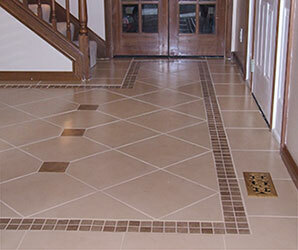 Our staff will help you choose the best stone or ceramic tile floor for your needs and design objectives. 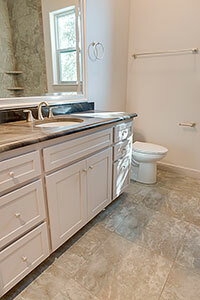 We will help you create your beautiful space with quality tile flooring.